We got our first new window for the house. We will be doing a few windows at a time as we work on particular rooms. The next two windows we order will probably be for the two rooms upstairs and that will make the second floor complete. Then it will be all the windows on the first floor. All eleven of them. Oh joy of joys. 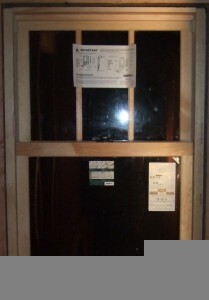 But I digress… We are replacing the windows with Marvin Ultimate double hung. The windows right now are very leaky and need replaced. We really wanted to keep the look of the old ones as the windows are a big part of the charm of our old house. Slapping some big vinyl picture windows in just wouldn’t cut it. We looked at a lot of windows online and then culled it down to Pella, Kolbe, and Marvin. We ended up picking Marvin over Kolbe as the price was similar but the Marvin seemed better built. The floor model of Marvin had more detailed wood work and higher quality gaskets. This particular window is aluminum clad on the outside and pine on the inside. It has interior and exterior muntins (bars that separate the window panes), and spacer bars between the glass for a more accurate divided light appearance. The sash lock is an oil-rubbed bronze spoon lock which keeps the old look. It has a U factor of .31 which is an R value of 3.22. This is important to us as we continue in our quest for a very insulated energy efficient house. Lee wanted to go with a straight grain Douglass Fir interior which would have been more in keeping with our house, but that added another two hundred dollars to the price so we decided we could live without it. Lee plans on building a window seat by this window. Then we will stain the wood to match all the other woodwork in the window seat. But that will be a ways down the road, so right now I just admire it. I don’t have an outside picture of this window at the moment, but the exterior trim has been replaced to maintain the current trim style. We like the window trim a lot, and it seems to be an uncommon design even in older homes. Of course, our new window doesn’t have an integrated angled sill like the old wood windows, but we went with a false sill with a angled top cut to approximate the look. An article in Fine Home Building (our reference for everything) gave us the idea. you are going to love those marvins. we remodeled a house in 1988 in suburban chicago and installed 35 marvin windows & doors. not one problem to this day. our builder insisted on this brand and i am so glad we listened. now when it comes to faucets? stay away from chicago faucet. they do not hold up, we replaced all 6 within 5 years and we are only a family of 3. good luck. Zoe, thanks for the good word about Marvins. We vacillated on brand quite a bit, and it’s hard to decide from reviews online (there’s people who love and hate all of them). These seem really well made though. I look forward to getting a couple more in and finishing the upstairs.